Beginning right where we are...First Christian Church...that is what Loving Hands is all about. Loving Hands is a "mission trip right here at home" for our church. Led by Carrol Russell and Pam Horton, this volunteer ministry helps people within our church. Do you need a ride to a doctor's appointment or to the polls to vote? Perhaps you're not able to change the furnace filter, or the battery in your smoke alarm. Volunteers will help you with your grocery pick up, minor car repairs, and especially rides to and from church. They even have volunteers to cover loneliness! These volunteers want to assist. All a person has to do is contact Carrol (283-5867) or Pam (624-7053). They will find the right person to meet your needs. This is our mission trip right here at home! All they need to know is your need. Your Church is here for you! Noreen Hyslop first wrote a wonderful article about The Festival of Sharing--excerpts have been used so that we could explain this amazing project. The Festival of Sharing owes its conception to our wonderful Ruth Mayer, who until her death in 2007, spear-headed the project. It has become a much-anticipated local event in October and one that involves many helping hands and generous hearts. It's the Festival of Sharing and this coming October, the mini-festival will conduct its seventh annual effort of collecting and distributing items to serve the needy across a vast area of the Bootheel west to Doniphan and north to Farmington. The Mini Festival of Sharing owes its conception to a special woman who brought the mini festival to Dexter, eliminating hundreds of miles of travel for local residents and agencies who benefit from the festival's efforts. Ruth Mayer, the first woman to serve as an Elder in our church, a teacher to many of us at school, and one of the sweetest (and demanding!) women you would ever be honored to know, organized the original mini Festival of Sharing in Dexter. We lost Ruth in 2007, but her legacy lives on. 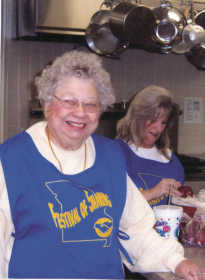 "Ruth was involved with the efforts of the Festival of Sharing for years and recognized the need and efficiency in setting up a satellite festival locally that would eliminate the cost in both time and fuel for churches and agencies to travel to the state festival at Sedalia to accomplish what we could do right here in Dexter," explains current Festival organizer Mary Ann Taylor. The Festival of Sharing is a combined effort to supply kits containing various staples from paper products to rice and beans to needy Missourians through donating kits to several agencies who converge on Dexter one Saturday each October to transport the goods back to their hometowns. Before that delivery can transpire, however, dozens of volunteers make up organized crews at the church who accept deliveries of the prescribed assembled kits that arrive by car, by truck and by vans. The kits are counted, stacked and labeled for pickup later in the day. Volunteers work in assembly-like fashion to bag the donated rice, beans, popcorn and other food staples into individual portions for the food kits. Others organize kits containing paper products, infant needs, bedding and other items with needs specifically determined by age. There are dental kits and personal hygiene kits, and "backpacks of love" kits, all pre-assembled and boxed and bagged, ready to distribute to the agencies who converge on the church grounds early in the afternoon. "The Southeast area collects and distributes for 27 different agencies serving the needy," Taylor notes. Some of those agencies who are recipients of the good deeds and generous donations in the Southeast area include gospel missions and shelters, such as the local Stoddard County Gospel Mission and the Center for Family Resources in Malden. Other agencies are the Mother to Mother Program locally, as well as the county's Children's Home, Stoddard County ARC and food pantries in Puxico and Bloomfield. Cash donations are also accepted. Carroll Russell and Winnie Morgan are the current leaders of this excellent project.